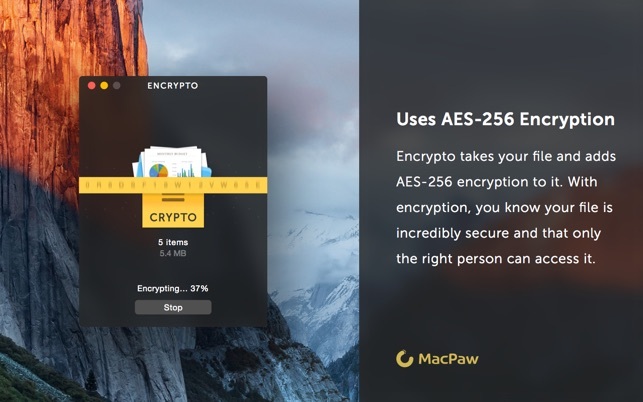 Encrypto is a free, easy-to-use app that lets you encrypt files with AES-256 encryption and then send them to friends or coworkers. 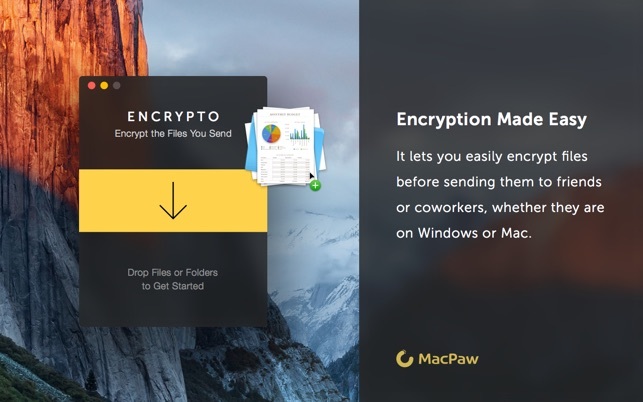 It works on both Mac and Windows, so you can send encrypted files without worrying whether the other person can open it or not. Take any file or folder and add AES-256 encryption to it. Let Encrypto give you peace of mind when it comes to the security of your files when sending them. Instead of relaying a password, include a unique, embedded password hint that only the recipient would be able to decipher. Share encrypted files via Mail, AirDrop, or Messages, or even share them with third-party apps like Dropbox. However you usually share, Encrypto has you covered. 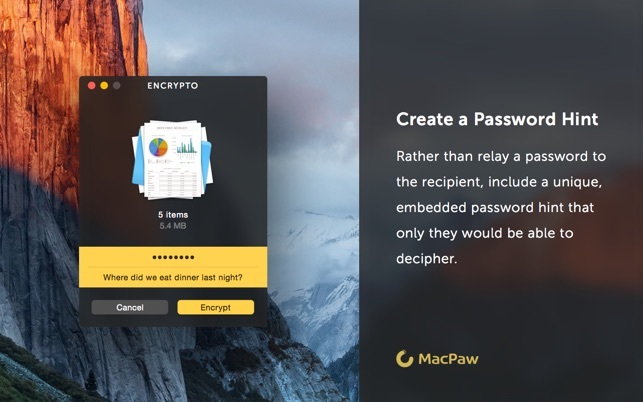 With Encrypto, you can encrypt your files even if you don’t need to send them. You know, for file security on your hard drive. Just put your file through Encrypto and boom — it’s protected. Share files with friends no matter their OS. 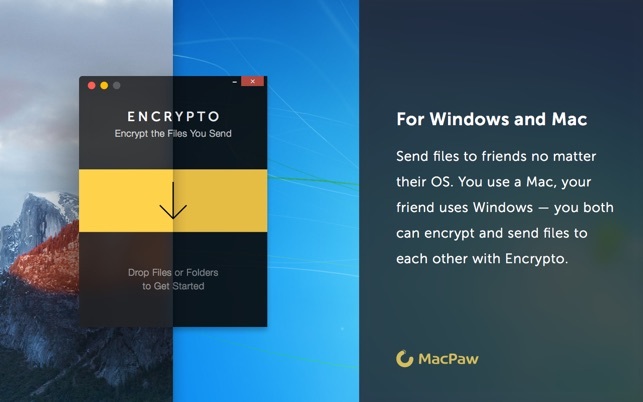 You use a Mac, your friend uses Windows — you both can encrypt and send files to each other with Encrypto. If your goal is to install this application on every machine you wish to share an encrypted file with, then this is the app for you. However this application is very limited with is compatibility. For example, you are created a duplicate version of your desired file(s) with their own filetype and password, so if you want to view or modify those files on another machine you are forced to use their software in order to do this. 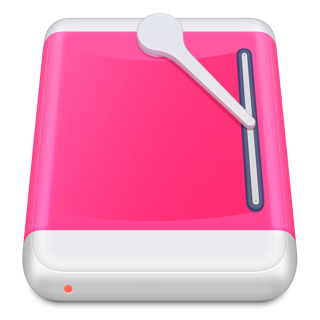 I would not recommend this application for those of you who simply want a way to password protect your files, as the added hassle of going back through the originating app tends to get annoying really quick. This is a really well-polished and well-made program for encrypting and decrypting files, but there are a few features that are missing. It’d be great if there were a setting to optimize the encryption, so we can use more of our CPU to help encrypt the file and bring down encryption times. Additionally, it’d be awesome if there were a setting that let us decrypt our encrypted files with open-source software like OpenSSL. in his enterprise envrionment without fear of others reading it. saved to your open finder window.